Lots going on over at ABCRIT. Paul Behnke writes on Pat Passlof. 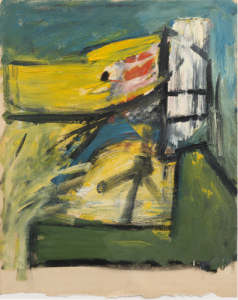 Pat Passlof: Paintings from the 1950’s at the Elizabeth Harris Gallery, New York. 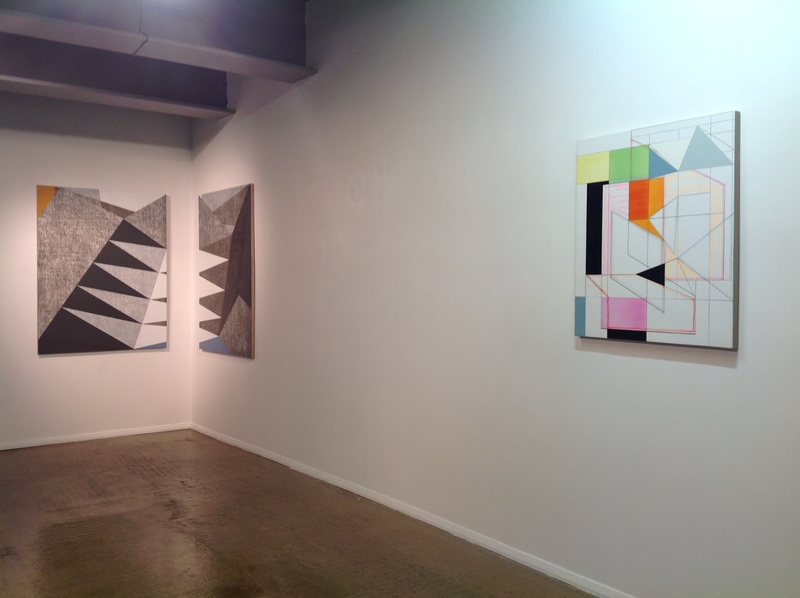 I have seen paintings by Francesca Simon at two exhibitions recently. 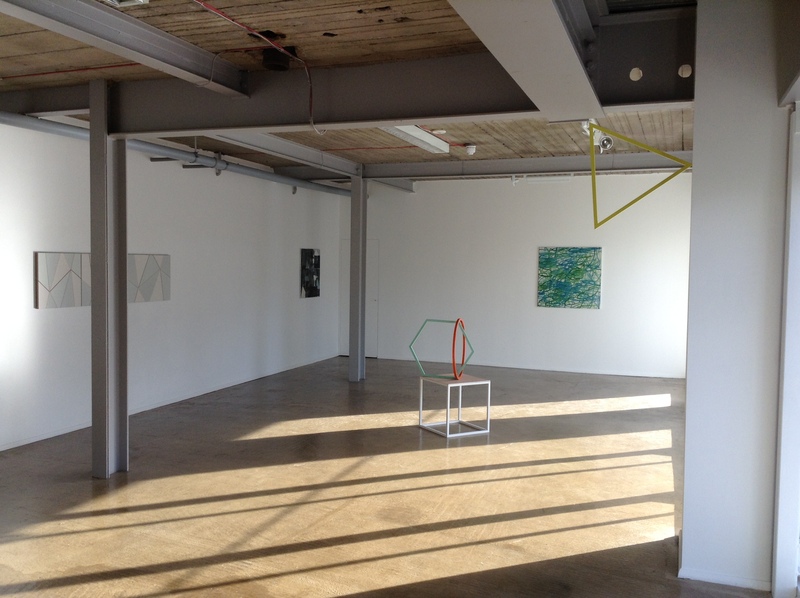 The first one was the group show Making Matters, at Platform A Gallery, a great space, quite big with lots of natural light doing justice to the work, whether the three dimensional objects by Kate Terry or the paintings by Andrew Bick, Katrina Blannin, Clem Crosby, David Ryan, and Francesca Simon. In my reviews of this show, at Constructed Realities and Saturation Point, I attempted to employ some distinctions to describe the work and noted that in applying them they seemed to break down. Taking the following list of binary opposites: Fact/Fiction, Object/Image, Construction/Representation, Faktura/Facture and System/Improvisation, it could be argued that all the artwork at Making Matters shows affinity with the terms on the left hand side of the dividing lines. However, these oppositions also provide a way of distinguishing between the works of the artists within the show. I could, for example, note that Clem Crosby and David Ryan demonstrate more interest in facture (including the handwriting of the artist) than say Katrina Blannin and Francesca Simon whose paintings could be situated more in the “faktura-over-facture” camp. However, the distinction breaks down if, allowing a confusion of logical levels, I consider that the preference for faktura is itself a signature style. Similarly, whilst Ryan’s and Crosby’s paintings may look improvised whereas Blannin’s and Simon’s look pre-planned, this distinction breaks down, even without a logical level shift, as I discover that the difference is simply one of degrees. Thinking in terms of degrees of improvisation could also provide a way of (speculatively) separating out the six Making Matters artists along a scale for improvisation, perhaps with Blannin at the lowest end, followed by Terry, then Simon, then Bick, then Crosby and with Ryan at the highest end. Seeing Francesca Simon’s new solo exhibition Site Lines at Beardsmore Gallery, I perceive more improvisation in her paintings than I did at Making Matters. There is evidence, in many of them, of decisions that were not followed through, lines that are marked out but not really used, disturbances on the surface, that subtly contrast with the very clear demarcation lines, edges and shapes that make up the final construct. I am reminded of the process of ‘brainstorming’ whereby a group of people generate new options by calling out, one at a time in strict rotation, whatever idea comes to mind. Although the majority of suggestions get rejected at the evaluation stage, they are absolutely required to trigger the breakthrough that results. Equally, I could think of the tremendous amount of labour involved in a construction site that is sublimated in the final, stable state of the end product, which would be closer to Simon’s abstract subject matter, the paintings shown here being directly influenced by the excavation and construction of London’s Crossrail project. Hence, we have titles like Close Construction and Double Girder Crane. That the works are serial seems to reflect something of the constantly changing nature of the site, literally just outside Simon’s London studio. The Close Construction paintings present a void around and across which various geometric elements are choreographed, and the Double Girder Crane series could easily have originated from seeing that massive crane every day traversing back and forth over the gigantic chasm. Differences in the crane’s position generate a variety of shapes, echoing the changes in relationship between crane and environment. These shapes, together with the almost aggressive flashes of colour, a yellow triangle here and the blue of the crane there, find their way into the work. 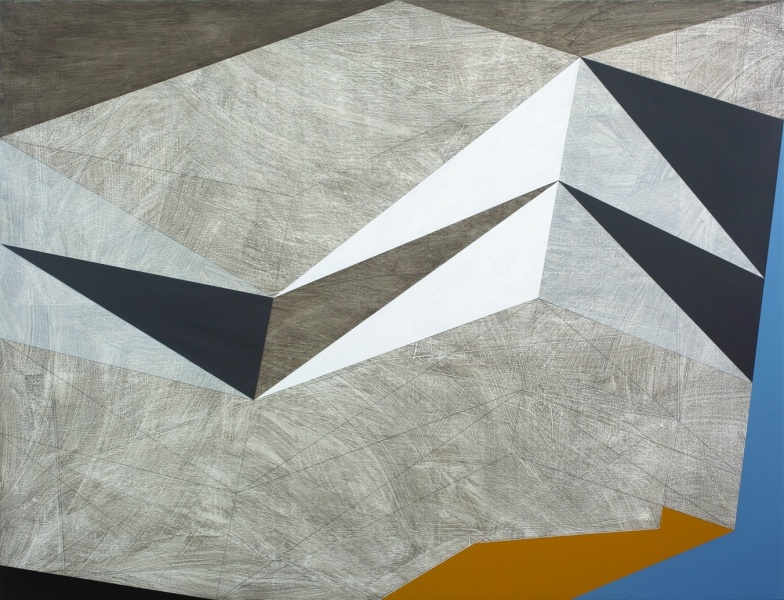 The geometry of this construction site, is documented, even its movement is here, the inherent stillness of painting being set into dynamism by the zig zagging of diagonal lines. Only the assault on the auditory sense is lost, in the silence of viewing. 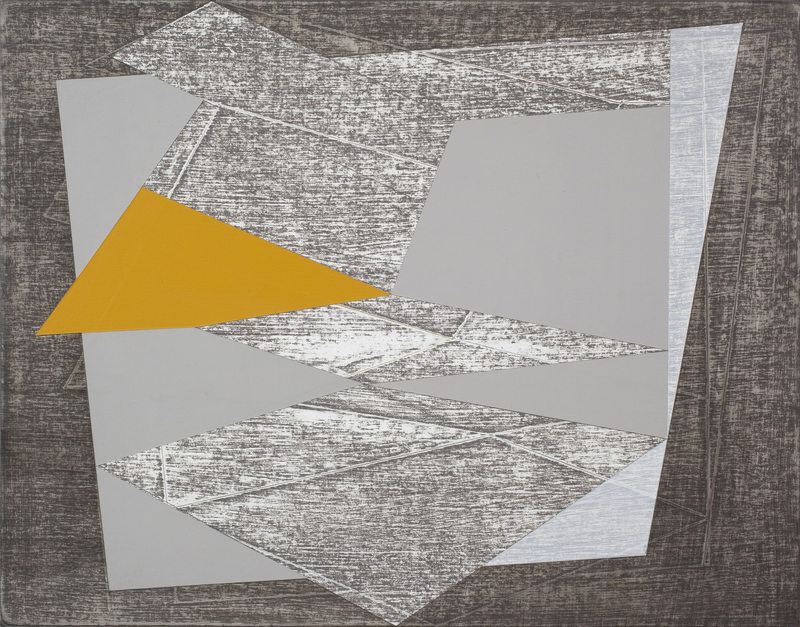 I would be wrong to find part to part isomorphism, the paintings are “abstract” after all, but not entirely autonomous, the outside world entering through a window into the artist’s lived experience, transformed by mental process and projected out again onto the paintings as geometric form. Employing again the binary distinctions with which I started, I return to the poles of construction/representation and wonder whether there is a double irony in Simon’s geometry: 1) whilst her paintings are not a window on the world, her ‘subject matter’ is a set of events taking place directly outside her studio window, and 2) her work draws on, and is closest to, the tradition of constructivism, yet here we find abstracted ‘representations’ of a construction site, as if to neutralise the opposition between construction and representation that, at one time, for me, was at the crux of the argument for abstraction. 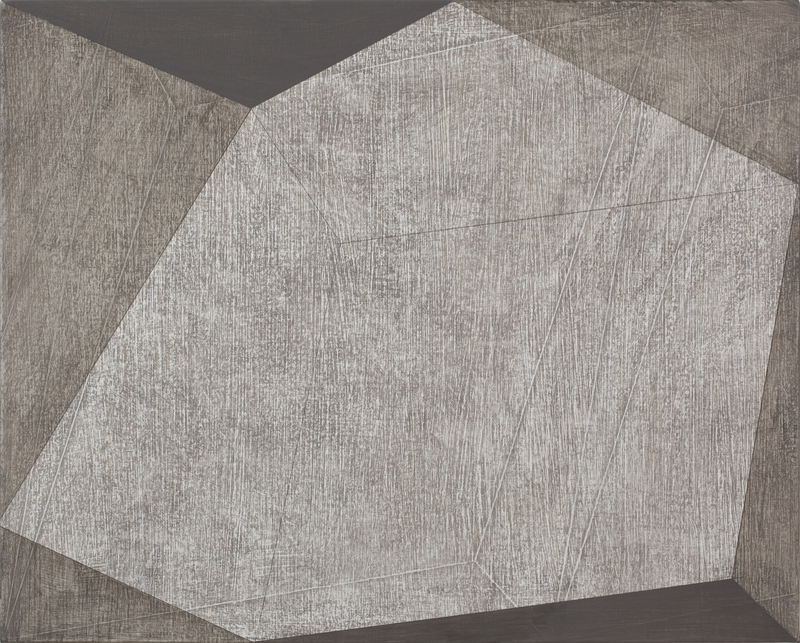 Not that Francesca Simon’s paintings are representational or abstract, more that they are both and neither. Site Lines continues at Beardsmore Gallery until 20 December.